The Commonwealth War Graves Commission casualty details describe John Cyril Hindson as the son of Mrs Frances Jane Hindson of Long Lane, Sedbergh and a gunner with the Royal Field Artillery who died on 30th November 1918. He is buried in Sedbergh Cemetery and has a CWGC headstone. His medal card has the bare details that he was entitled to a Victory and the British War Medals but does not indicate the theatre of war in which he served. His photograph appears in Craven’s Part in the Great War. His death certificate shows that he was aged 20 and that he died in the ‘Military Hospital Scotton RD’. Scotton is now included in Catterick Garrison. The cause of death is given as ‘Influenza and Bronco Pneumonia’, so he was a victim of the terrible influenza epidemic of 1918. The death certificate states that his profession was ‘Gunner RFA Doctors servant’. He was baptised in St Andrew’s Church on 1st September 1898. In the 1901 Census, he was listed as aged two years; he and his mother were living with her grandparents, John and Mary Ann Hindson, in Weavers Yard. His grandfather, John Davidson Hindson (who was also living in Weavers Yard), and his great grandfather were both wood sawyers and his mother a ‘charwoman domestic’. The family originated in Old Hutton. According to the 1881 census, John Hindson, sawyer and his wife, Mary Ann, both aged 57, were living at Bridge End, Old Hutton with John Hindson their son, a sawyer, aged 35 and Frances J Hindson, their granddaughter, aged 9. This research was done by Shirley Tebay, and Diane Elphick, both members of Sedbergh and District History Society. At eleven on Tuesday morning a short service was held at the Parish Church, at which a good number assembled. Gifts of a Bible, suitably inscribed, have been handed to the widows or other near relative of those who, from the Sedbergh District, have fallen in the war. As, in total, 38 men of the town gave their lives during the Great War, it is interesting that, as far as is known, this is the first Bible which has come to light. If any reader knows of any others or of any descendants of the Hindson family of Sedbergh, please do get in touch with the editor or the Sedbergh and District History Society. John Cyril Hindson, who was probably known as Cyril as this is pencilled on the case of the Bible, died ninety years ago this month and he, together with all those men of Sedbergh, who gave their lives in both World Wars, will be remembered at the Service of Remembrance on 9th November. Readers may remember an article in the last newsletter about John Cyril Hindson and the Bible which was presented to his family following his death in the Great War. An appeal was made for news of any other Bibles, given to families of other casualties, which might have survived. Mrs June Pickles of Cromer in Norfolk has been in touch with the Editor to say that her family has one, which is identical save for the name and date on the bookplate. This Bible was given to the family of her grandfather, Thomas (Tom) Cragg, who was killed in action on 14th April 1918 while serving with the 1st Battalion the Duke of Wellington’s (West Riding) Regiment. He was aged 40. Thomas Cragg was born in Dent and was the son of Joseph Henry and Annas Cragg. In 1881 Joseph was a grocer and agricultural labourer in Gawthrop and Thomas was two years old. By the time of the next census in 1891 the family had moved to Broad Yeat, Dowbiggin. On the night of the census, however, Thomas was staying with his grandmother at Low Hall in Dent. Joseph and Annas Cragg lost another son in the Great War. Thomas’s younger brother, James, was killed in action on 9th September 1917 while serving with the Northumberland Fusiliers; he was aged 33. Thomas was married and, at the time of the 1901 census, he and his wife, Anne, were living in Garston near Liverpool. He was working as a sawyer’s labourer at a bobbin mill. They later had three children, including Joseph Henry, the father of Mrs Pickles. Thomas Cragg has no known grave but his name is inscribed on the Tyne Cot Memorial, which is about six miles north east of Ypres in Belgium. Also, he is remembered on his wife’s gravestone in Sedbergh Cemetery. She died on 19th September 1960, aged 82. The History Society has a copy of a beautiful card which was designed in memory of Thomas Cragg. Around the edge are the words: ‘Their bodies are laid in peace but their names live for evermore’. There is a sketch of the Howgill Fells with the church steeple in the middle ground. The wording is: ‘1914-1919. In Mem. Thomas Cragg’ with the first verse of Rupert Brooke’s poem, The Soldier, which starts, ‘If I should die think only this of me ...’. Grateful thanks are due to Mrs June Pickles for contacting the Lookaround and to Shirley Tebay for the information from the census records. The portrait of Great Uncle John Dawson hung in my grandmother's house in Prestatyn until she died in 1929, my mother inherited it and I can remember it all my life. Both my parents taught in prep schools and the portrait moved around with them from Wales to Moffat in Scotland to Ripple in Kent and then back north via North Wales to Croft on Tees in the North Riding. When my parents finally retired aged 70, the flat in the Rectory at Croft went with the job, so we looked for a home down South on or near Romney Marsh so that they would be nearer to us as we were running Rye Tiles in Rye. The Portrait of course, moved with them to their new home in Hythe and when they finally died I inherited Great Uncle John and started to investigate its history. 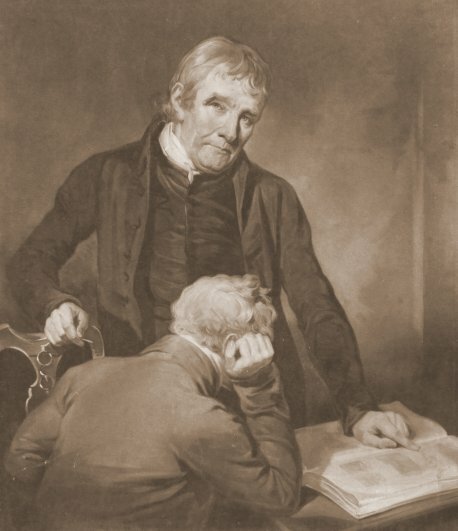 Great Uncle John was JOHN DAWSON the Mathematician (1734-1820), and once we had drawn out a rough family tree we realised that he was not an uncle but a cousin, probably the family legends about his fame and relationship had started when he was already an old man and therefore more respectfully called Great Uncle John! 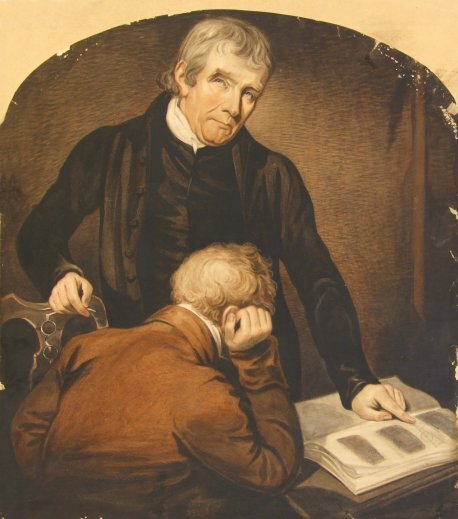 "I give to the Reverend THOMAS HARRISON (1800- 1869) Vicar of Newchurch in Kent all my books and manuscripts, the two portraits of my late father, my snuff box marked "JD" on the lid on a gold plate and also…." The Revd Thomas Harrison died in Sedbergh in 1869 but his will of 1865 makes no mention of the portraits or indeed of any of his possessions. He left £50 to his niece ELIZABETH HARRISON daughter of his brother WILLIAM of Whitbeck in Garsdale and " the remainder of all my Real and Personal estate of whatever kind to my wife LOUISA HARRISON." This will was proved in Ashford Kent 18 November 1869. So here the trial goes cold, the Portraits obviously left Romney Marsh for Sedbergh, but who then acquired them? The DAWSON & GREENBANK Families were united in Garsdale with the marriage in 1854 of FANNY (1823 - 1892) d. of ROBERT (1781-1863) & JANE DAWSON of PINFOLD to THOMAS KING GREENBANK (1804-1880) " Professor of Rhetoric" at Owens College Manchester and part time insurance agent, their daughter JANE HAYTON TURNER née GREENBANK (1861-1929) was my maternal grandmother and who, I have always understood inherited the painting along with other pieces of furniture, some painted china  and a brass saucepan from her mother Fanny. So at present at least one portrait of JD has returned to Romney Marsh after over 100 years away. The whole of this puzzle resurrected itself recently, when we purchased a framed engraving, which we presumed was taken from the Joseph Allen portrait of JD, from RFG Hollett & Son. Christopher Hollett told us that it is only the second print that he has handled in 20 years. We began to make comparisons between the engraving and the original water colour. Firstly the subject is the same but the outer sizes do not correspond. The engraving is 530 x 420mm whilst the painting has diminished in size and has an arched top or perhaps it always was a different size. We have had the w/c out of its frame and cleaned and there is none of the w/c hidden. Or perhaps it has suffered damage to the edges during the course of its life. The eyes are very different. The w/c has narrowed eyes while the engraving has much fuller and kinder ones. Was it the eyes that Peacock did not like? If so, perhaps he then painted a kinder face, if that is the case then is the engraving taken from Peacock's and not Joseph Allen's water colour? Is there any actual proof that the print was taken from the original Allen portrait. Can any member help us with solving this detective story? SEE PHOTOGRAPHS OF THE 2 PICTURES IN OUR POSSESSION.